attention from industrial to service robots. The robotics industry is on the cusp of a major transformation. Today’s factory robots are solitary precision instruments, mimicking the repertoire of capabilities of skilled craftsmen while repeating a handful of tasks thousands of times over. But future factory robots will likely have to be capable of thousands of tasks, performing each only several times, and they will work in collaboration with humans. Furthermore, interest in nonindustrial robots is emerging at an even quicker pace, and new and larger marketplaces are opening up as never before. 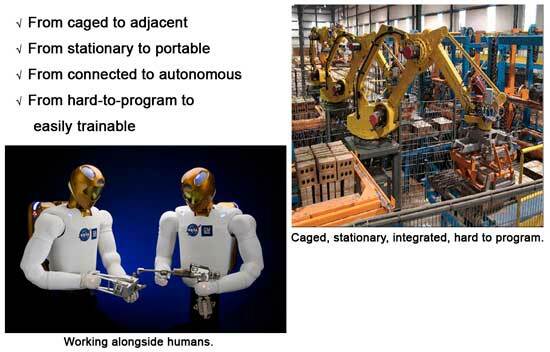 But that means some pretty significant shifts in design from caged robots to adjacent workers, from stationary position to portable motion, from programming intensive to easily trainable, and from connected to autonomous robots. Even as they work to improve upon their current industrial offerings, robotics companies are closely watching demand for co-robots, which are the safe, flexible, vision-enabled and easily trainable robotic assistants that science fiction movies made culturally popular. Thus the reinvention of robotics is fundamentally a transition from industrial robotics to service robotics, and one that is demanding flexibility and versatility beyond what is presently available. Examining the strategies and unique approaches of companies making this transition can lend insight into how manufacturers will overcome the technological challenges, position themselves among competitors, and bring new robots quickly to market. KUKA announced a transition roadmap last year predicated on their participation in the SME Robot Project. They plan to provide lightweight arms, add mobility, and improve their grippers, as well as moving into heretofore untapped industries. They’ve released a new lightweight and sensitive arm that can be affixed to a tabletop or workbench that is sensitive enough to safely work alongside humans. They also have plans to take their manufacturing and automation experience and enter new marketplaces, particularly entertainment (they have a ride robot), assembly and co-robotics (delta-type robots and lightweight arms working alongside humans), and healthcare and medical (cleanroom robots, lab robots). Kuka has also developed an entirely different type of robot: the youBot. It’s organized for the education and research marketplace and includes a mobile and also fixed 2-fingered 5 DOF plug and play robot arm selling for $31,000 and $21,000 respectively. youBots run the open source robotic operating system ROS prevalent in most major robotic learning centers and could be Kuka’s inroad to the co-robotic market. At present, however, their proprietary operating and control system for their whole industrial robot line of products, and their robot training and simulation capabilities, are far too complex, convoluted and restrictive for the SME market. 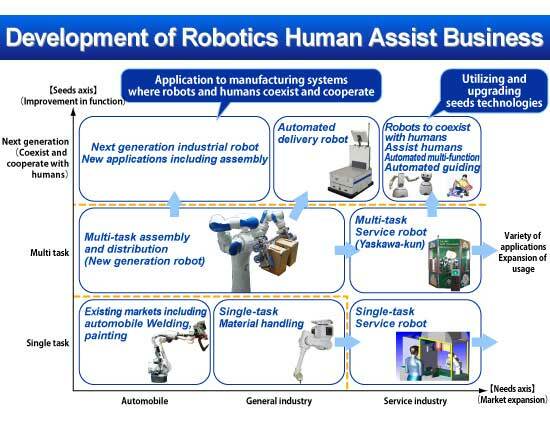 Yaskawa is developing a line of robotic products to fill the “Robotics Human Assist Business.” The SME marketplace is included in their plan as are new market areas where robotic devices augment and assist humans. Their plan covers workers, seniors, disabled people, and early adopters of other human-assist products. a prototype for their next generation human assist robot. Yaskawa is already marketing their two-armed Motoman multi-tasking robots and expects to begin introducing additional products and capabilities in 2015. They recently restructured their R&D by creating a new Smart Robotics Center (SRC) with the mission of accelerating R&D to enable human assist products and their 2015 target date. Yaskawa has also embraced the use of the open source Robotic Operating System (ROS) to enable Yaskawa users — and others — to be able to better simulate and add new technologies and devices to existing robotic installations. Additionally they are strategically partnering with other companies that have specific expertise in 3D vision and adaptive grasping to augment in-house capabilities and meet the 2015 launch date. Adept’s strategy is meshing proven business processes with new tech to form commercially ready solutions and involves (1) acquisitions to supplement and acquire capabilities it feels it needs for the future, and (2) aggressively marketing into new markets in food processing and materials handling. One acquisition enabled Adept to add mobility to its line of products; another supplemented Adept’s food processing technology arsenal and offered a European base as well. Through it’s 2010 acquisition of MobileRobots, Adept now provides a mobile platform for a variety of purposes. One purpose is as a gofor in a hospital. They’ve teamed with Swisslog to ferry medicine from the dispensary to nurses stations and back again thereby enabling nurses to focus on patient care instead of getting things. Adept’s mobility goals include doing simple service tasks presently done by low-cost but hard-to-hire labor, e.g. restaurant staff, who could use mobile tables to follow, deliver and pickup. Adept is also building their new mobile robots as modules and selling any or all of those modules. In Swisslog’s case, they are selling a mobile platform and navigation system but they are also selling the nav system and sensors separately to other clients. By acquiring InMoTx, a Danish provider of food-processing technology in 2011, Adept was able to add a portfolio of flexible gripping IP (intellectual property) for inspecting, sorting, grading and hygienically packaging unwrapped food products. Hygienically gripping irregularly shaped food products has emerged as one of the biggest constraints in automating food packaging. This acquisition expands Adept’s capabilities and supplements their goal of further capturing a share of the global food processing and handling market. Bosch makes consumer products, appliances and auto parts. 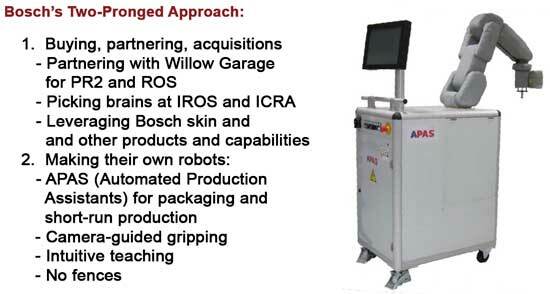 They are also an integrator for factory packaging systems and build and provide packaging robots. Many of their auto and consumer products are turning into “smart” devices and will someday become robotic. Imagine how desirable it would be to purchase a Bosch washer and dryer that also had a robotic device to feed, transfer and fold, thereby providing hamper-to-hamper service. 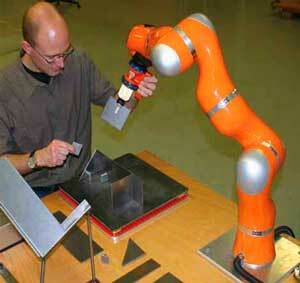 Many of the parts involved in Bosch’s manufacturing process are too small for present-day factory robots. So they have a two-pronged approach: learn, buy and partner from everyone and, if necessary, build their own robots. Their new home-built APAS robot is already being field tested in their factories for intricate handling and assembly work. Up until late 2011 when Pres. Obama made manufacturing and robotics an issue, the US lacked public-private activity like the EU’s SME Robotics project. But there was independent venture-funded activity. Rodney Brooks, one of the founders of iRobot and a professor at MIT, started a company to develop a low-cost co-robot. Still in the development phase, but venture funded to the tune of $32 million, Heartland Robotics has more than 60 people working full-time to produce a low-cost, flexible, easily trainable, lightweight robotic assistant (co-robot). One of the more interesting aspects of Heartland’s project is providing an Apple-like app store where users can share routines and functions. Although the Boston Globe intimated that the Heartland robot would sell for only $5,000, be on a rolling base, be trainable without programming, and have sensors which enable it to work safely with humans, the currently rumored price for a Heartland single-armed co-robot is $15,000.Although Heartland hasn’t officially announced a launch date, they have reserved a large booth at next January’s Automate 2013 in Chicago. A media launch date will be earlier, but the Automate show will be a place for a lot of would-be-users and buyers to see the new bots in action. Meka Robotics, Willow Garage, and SRI just announced a new startup competitor: Redwood Robotics. Their website says they will be offering a new generation of robot arms that are simple to program, inexpensive (“in the $10,000 range,” says CEO Aaron Edsinger), and safe to operate alongside people. These three partners bring a lot of robotic talent to the table and are a formidable competitor for Heartland. The clock is ticking for this type of co-robot. The first one to market will benefit. Will it be Heartland, Redwood or somebody else? Cynics thought Foxconn’s 2011 announcement that they intended to deploy 1 million robots in their factories in China within 3 years was a ploy, a trick, impossible, unreal. 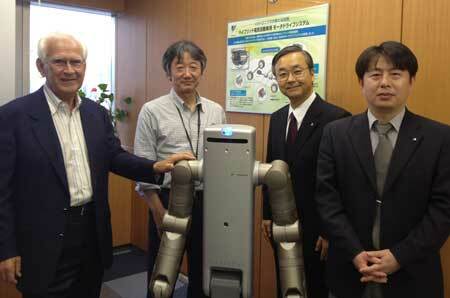 But in late 2011 they launched and built an R&D facility and a factory in Taiwan to build their own robots. And they’ve begun to hire 2,000 engineers to man this project. 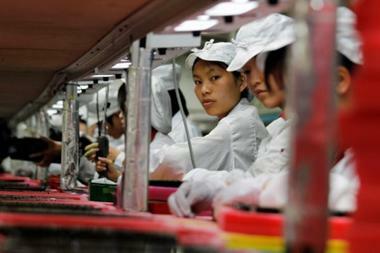 Nobody knows yet whether any other robot manufacturer will supply Foxconn. 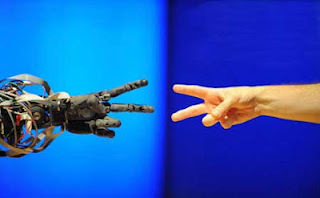 However, rumors say that ABB may be in negotiations to provide them with some of their headless two-armed FRIDA robots. Global demand for robotic solutions is increasing, thus the world of robotics must change rapidly and cultivate scientific solutions to enhance the technologies to meet those needs. Those robotic companies – like the ones presented in this article – who will succeed in this new industry, are those that can best develop applications and robots that meet those changing needs.Robots like C3PO of Star Wars fame are getting closer every day! A version of this post originally appeared on Singularity Hub, June 6, 2012.